Kozo Yamaguchi is currently Executive Vice President of AISIN AW Co., Ltd.
Mr. Yamaguchi was born in Japan in 1956, and lives in Chiryu City. 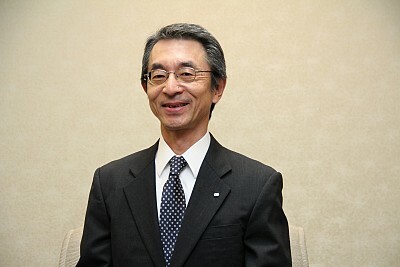 In 1981, he graduated from Nagoya University with a master’s degree in aeronautical engineering. In the same year, he started his carrier at AISIN Warner Ltd., where he mainly engaged in Reserch and Development of automatic transmission and cvt, hybrid system. In 1992, he became Manager of the Development Planning Department. In 1999, he became Project General Manager of the EV Development and was appointed General Manager in 2002. In 2003, he became Director of the company and in 2006, Managing Director. In 2010, he was Senior Managing Director and in 2012, Executive Vice President. Spotlight on AISIN AW Co., Ltd.
With their keen ability to perceive both their surroundings and the intensions of their human masters, stallions have served as humankind's preferred mode of transportation since ancient times. At Aisin AW, our dream is to make a car more like a stallion. Our automatic transmissions are like the delicate nerves and muscles of the stallion; our car navigation systems, its brain; friendly to the environment like a stallion, our hybrid system. In line with this thought, Aisin AW has been introducing drivetrain systems achieving both high driving performance and environmental friendliness, such as 6 / 8 speed automatic transmissions, CVT and hybrid systems. They have been supplied to Toyota and other car Manufacturers around the world. Our car navigation systems are currently available globally, and their map database will cover 61 countries/regions within 2010. We have also developed the Navimatic system, which determines upcoming road layout in the vehicle's direction of travel, based on information from the navigation system in order to provide optimized shift control. Only a manufacturer with expertise in both automatic transmissions and navigation systems like Aisin AW could produce an innovative product such as this one.